The skid control ECU measures the speed of each wheel by receiving signals from the speed sensor. These signals are used for recognizing that all four wheels are operating properly. Therefore, all wheel signals must be equal. DTCs C1275/75 to C1278/78 will be cleared when the speed sensor sends a vehicle speed signal or when Test Mode ends. DTCs C1275/75 to C1278/78 are output only in Test Mode. 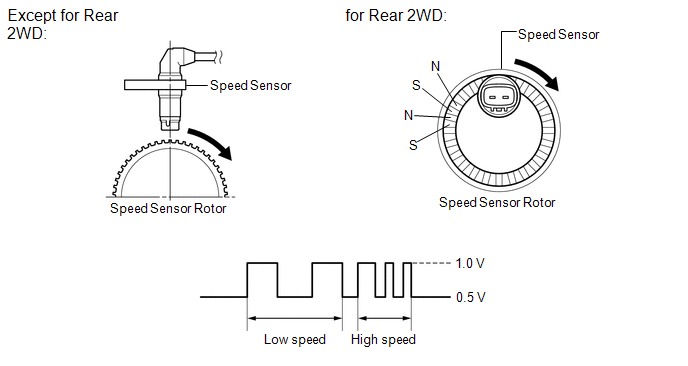 Discrepancy among four wheel speed sensor output. Abnormal pulse signals from 3 or more sensors. Continuous ABS control is performed on at least 2 wheels for 60 seconds or more. 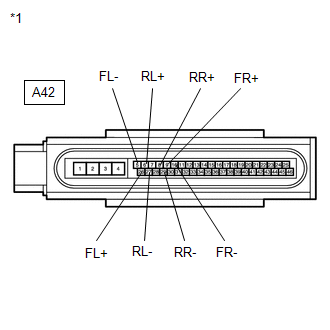 DTC C1275/75 is for the front speed sensor RH. 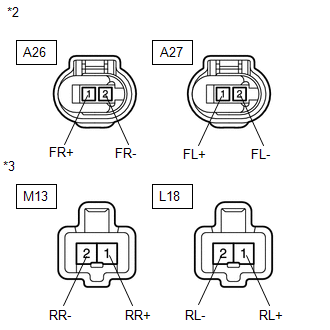 DTC C1276/76 is for the front speed sensor LH. 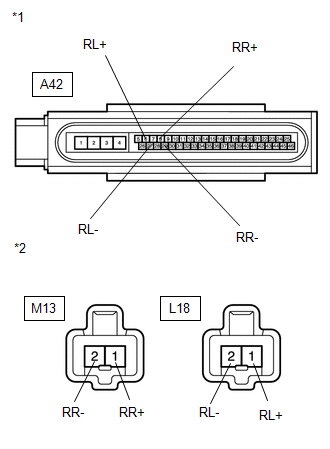 DTC C1277/77 is for the rear speed sensor RH. 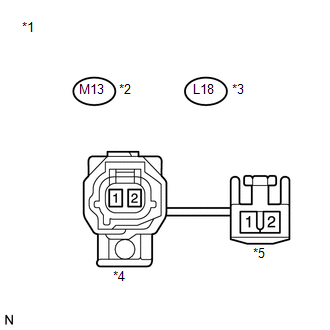 DTC C1278/78 is for the rear speed sensor LH. (a) Check the size and condition of all four wheels (See page ). The DTC is output when tire deformation or a difference in tire size is detected. The diameter of all four tires and air pressure are the same. (b) Check the speed sensor tip and speed sensor rotor. No scratches, oil, or foreign matter on the sensor tip and rotor. (a) Install the speed sensor and speed sensor rotor. (c) Disconnect the skid control ECU connector and the speed sensor connector. (a) Reconnect the skid control ECU connector and the speed sensor connector. (d) Drive the vehicle at a speed of 20 km/h (12 mph) or more for at least 60 seconds. (c) Drive the vehicle at a speed of 20 km/h (12 mph) or more for at least 60 seconds. If the speed sensor rotor needs to be replaced, replace it together with the drive outboard joint shaft assembly. (a) Install the drive shaft assembly. If the rear speed sensor rotor needs to be replaced, replace it together with the rear axle hub and bearing assembly with rear speed sensor.